Uniquely different, Barbara Gail's Lamps offers you a true handmade custom lamp or lampshade. themed lampshades, you will have a lamp to cherish for years to come. Not into the beach? Then check out the country lamps section for pine cone themed lamps. 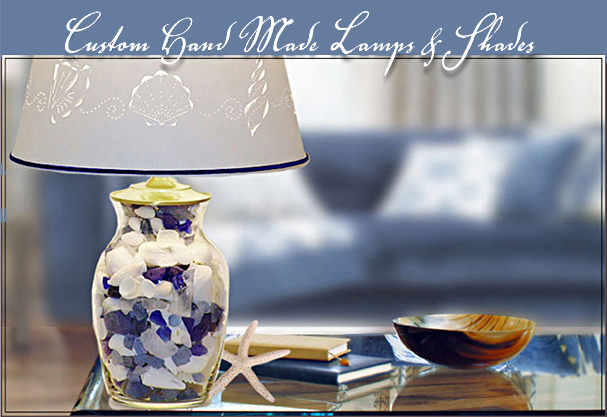 Barbara Gail Original Lamp and make your home "light up" today! As the owner, designer and maker of Barbara Gail's lamps and lampshades, there are 2 things that are most important to me. #1: I want you to be very pleased with your order and #2: every order no matter how large or small, gets 100% attention. Cut and pierced lampshades can't be 'rushed'. They take time and patience and I have to be pleased with the finished product before I ship it out. There are few things left that are truly made in America. I can say proudly that all of my lampshade materials are made here in the USA from start to finish. So if you are looking for a lampshade that is unique and special, or need a lamp to hold your special seashells, please consider a Barbara Gail original...all handmade one piece at a time. ***ORDERS PLACED NOW WILL NOT MAKE IT IN TIME FOR CHRISTMAS SO PLEASE PLAN ACCORDINGLY*** ! Please click http://www.barbaragailslamps.com/aboutus.asp to learn more about us. Copyright © Barbara Gails Lamps. All Rights Reserved.